And, if you didn't come along for this trip, you missed a great time. With the donations received, especially the generous gift from Robert Merkel, the Committee was able to keep the cost very affordable. Over 100 people attended the event at the Palm Pavilion, more than 240 people at the Welcoming Reception and approximately 210 at the Dinner/Dance. This was an incredible turnout, even better than our 20th. The highlight of the entire weekend was the presentation Saturday night by our veterans, including a poem by written and read by Jim Drain and a speech by Phil Ferrazano. Phil's words silenced the room and brought us all closer to understanding the feelings of our vets. Thanks to our veterans for a job well done! 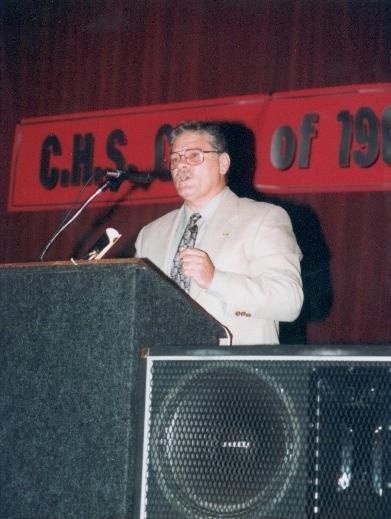 Reunion attendees also voted to establish the CHS Class of 1968 Scholarship Fund, which will be awarded each year to a qualified high school senior. The scholarships will be funded completely by donations from classmates, with the hope of each classmate making a donation of at least $19.68 each year. Lynne Edelman Faimalie is chairing this effort and coordinating the selection of recipients. 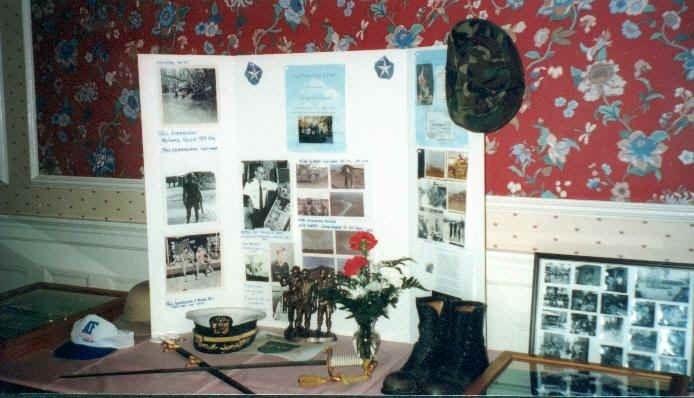 Two display tables were set up, one expertly created by Tom Watson with a wide variety high school memorabilia, the other displayed many articles collected by our veterans in honor of their service. A reunion booklet was published and it was filled with pictures and information from the weekend. However, the question left unanswered in many people's minds is what really went on in room 110??? The following are just a few of the many e-mails and handwritten notes the committee received following the reunion. Several are very touching. It was a tremendous event, and thanks to everyone to attended and made it what it was. Please note that the you refers to the whole committee, as these comments have been received by various people. Excellent job - well done weekend. Thanks for all you did to make it so great. My whole family had a wonderful time and are still talking about it. It was a great bonding experience. Especially the 4 younger CHS graduates that ended up in room 1110. Only 2 were mine and they were over 21. We are still laughing and hooting about it. I think most of the red is out of my face finally. All though it wasn't my son who was passing out the kisses. My four kids came to the dance as well as 3 of their friends. I thought it was kind of neat since 4 of them are this years seniors and are in the top 10 academically in the class. I hope it planted some seeds. In the business meeting, what I was trying to get at was starting a tradition where graduating classes started working on a tradition of collecting money like the $19.68 right after they graduate. Also keeping track of their classmates before the 10 year reunion and then scrambling. I guess we will see. They all can't wait for their reunions now. I look forward to getting together with everyone and sharing stories. My sincere thanks and gratitude for making this such a great reunion. It was one of the most enjoyable weekends I have ever had. Once again, sorry I could not make it. From the Email/net buz, it sounds like I really missed out! Just wanted to thank you again for the wonderful job that you did on the reunion. I am now starting to get withdrawal symptoms because no new postings of E-Mail addresses are appearing on the board. I'm anxious to hear all the feedback from the reunion. I couldn't stay for Saturday night, so I'm hoping you'll post some stuff on the web page. I had a really great time Thursday and Friday and really was glad to see you and everyone else.Can't wait till the next one. Wonderful job with the reunion. Congratulations on all your efforts - it was great. See you soon. You folks do put on a great reunion. My bro class of 72 has nothing like ours. Sure makes me want to lecture kids about electing people who will DO the many things necessary to run not just a class but in your case, a lifetime of meetings! You will never know how truly thankful I am for your work. I only wish I'd known more folks back then as you all turned out swell. Wanted to thank you once again for the tremendous job that you and the committee did at the recent Reunion. I know it must have taken an incredible amount of time and effort to organize this event. Thanks again to all the committee members for putting on such a great reunion. And Thank God for nametags! Speaking as one who has not lived in the area nor kept in touch, I want to say how wonderful it was to renew old friendships, and make new friends. Hopefully we'll stay in touch more over the next 30 years! Oh behalf of the entire CHS Class of 1968 Reunion Committee, we would like to extend our thanks to the following people, whose generous contributions made our 30th reunion such a success. Without these contributions, costs to individuals would have been much higher, and less people would have been able to attend. Once again, thanks to all of you listed below. Turned into an unforgettable night for everyone attending this reunion. Jim Drain's opening remarks started us on our mental journey back to the Vietnam era. Jim ended with a poem, "Film at Eleven," about the war that he wrote especially for the reunion presentation. Jim's poem reminded us of the fear and trepidation many of our classmates felt as they faced the unknown, thousands of miles away from their friends and family, and the uncertain feelings our veterans' were confronted with upon returning from their tour of duty. 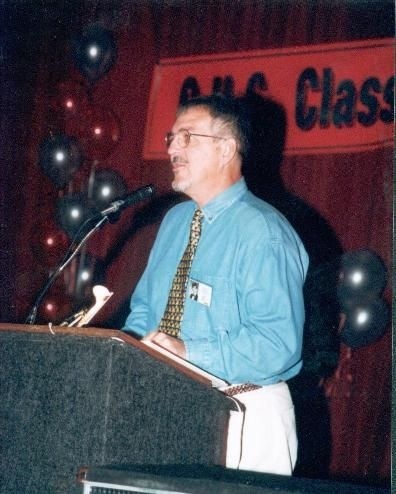 Following Jim's poem, Phil Ferrazano gave a speech entitled, "Dedication to Veterans," that as Scott Brumfield so aptly put it, "Phil had been writing for 30 years." Sounding like Bobby and/or John Kennedy, Phil spoke, and let us all understand a little better the feelings of each and every veteran. It was an amazing experience. Thanks to all who participated in any way in this effort. It was the highlight of our reunion. It energized the entire event and touched, in different ways, each and every person in that room Saturday night. As usual, click on any picture to view an enlargement. Good Evening. I am proud to stand before you tonight representing the Vietnam Veterans from the class of 68. Thank you for allowing us just a few moments this evening to recognize those from among our class who, when asked by their country, answered the call and served during the conflict in Vietnam. Since the U.S. ended its involvement in Vietnam, much has been said of the politics, the outcome, and the impact of the war, and it's been mostly negative. Nevertheless, there were also some positives. One of which was the courage and discipline, demonstrated regularly by the individual American fighting soldier. Despite questionable objectives, often confusing leadership, and waning support from the home front, American soldiers fought with courage and dignity, with very few exceptions, until all were finally allowed to return home. Among those brave men and women, many were your fellow classmates. And now, though many years have passed, we can all extend to them, a heartfelt "thank you and welcome home." Now I would like to share with you a poem I've written that I've titled "Film at Eleven". The shooting, the explosions, and the weekly body counts. It became more and more real And it became something to fear. In school it was college or Nam. "Where you goin' to college?" And then I was there! And it still seemed unreal. and it was very much something to fear. Surviving and coming home should have been great and was in many ways. But in some ways it was still unreal. as one of those "baby killers." When I first saw "Rambo" it was on T.V. and it seemed so unreal. The shooting, the explosions, the body counts. The anti-hero, crazy, Vietnam Veteran. And it became something to fear. It took a decade or more for that sick national mood to pass. The first time I saw "The Wall" it was on T.V. I've yet to visit the memorial in Washington D.C. but will soon enough. It's something I'll do with some fear, the unleashed emotions and all. on some high-numbered cable channel. "The lessons learned from Vietnam." Have we learned? I hope so. One generation having to deal with an "incorrect" war is plenty! I know the subject of the Vietnam War is not easy to talk about, but it was part of our history, and there are over 58,000 reasons why we should never forget. I'm proud that our Class of 1968 thought it was time we recognize those who served our country. I feel honored to have the opportunity to speak a few words for myself and my comrades, and for those who's lives were touched in anyway by the Vietnam War. By 1968, I think most opposed the war. We know some volunteered and some served against their wills. No matter. Once called, all served with honor and all, in some way, became emotionally attached to the war. Vietnam for us, played hell on the mind. You were pulled between an obligation to your country - American Tradition - and what you believed was morally right. Vietnam was a difficult time for all of us. On Valentines Day 1970, there were four of us from Clearwater that landed in Vietnam. We hung together like lost puppies away from home. We were sent to the Headquarters Co. for the 9th Infantry Division for orientation, and to be told some of us wouldn't make it home. After a few days we were separated and sent to different units. My last night at the HQ Co., I walked guard duty around a building. On one side of the building there were aluminum caskets lined up ready to be sent home. Every time I got to the side of the building with the caskets, I couldn't help but look. I couldn't stop thinking of what may lie ahead of me in my one year tour of duty. Would I even make one year? I glanced to the stars that night with tears rolling down my face. That night, I truly realized the party was over. My youth would now be something in my past. I thought of my wife of only two months, my family, my friends and I thought of myself. What kind of person was I? Did I have it in me to be a soldier? How would I react when called upon? What would I do when faced against the enemy? Would I be wounded or killed? Sadly, these fears were becoming reality, each event building to the ultimate climax, when I almost died. You'd think dying was my greatest fear. - I felt close to God-so, I didn't fear it. You get religion real fast in a foxhole. I can remember at that time being very tired and worn out, both physically and mentally. It was confusing at home. My family received word I was wounded to the head without knowing if I was all right. This, one week before my younger brother graduated from the class of 1970. Prayers echoed the halls of CHS for me. It was confusing for us, too, in Vietnam. We didn't want to be there. We didn’t even know if we were doing the right thing. We first figured we were there to win a war. It turned out it was a battle to fight for you and your buddies to survive. We felt alone in our struggles and depended on each other. We were sick of all the politicians back home that wouldn't do a thing to stop the war. The same ones who turned down bills for veteran's benefits, the same ones who found ways for their sons to avoid the draft. I hated the war. The endless miserable rainy nights, the feelings of worthlessness and loneliness, the wondering if your next step would be your last, and the empty feeling you got as you watched a buddy die. Please don't tell me about government policy and betrayal. Don't tell me what it was really like in Vietnam. My comrades and I can tell you. I was wounded on May 26th, 1970, during the Cambodian Invasion. We, as Infantry soldiers, feared and had doubts about going into Cambodia. Many times we stood and refused certain orders we knew were unsafe. We had a saying, "What could they do to us..draft us , put us in the infantry and send us to Vietnam?" Back home, all were celebrating a Memorial Day Weekend, while I was experiencing the true meaning of it first hand. It was around four in the morning when we were attacked by a large, well trained, NVA force. Mortars landed on my position and altered the way I would live -- forever. I lay wounded, fighting for my life, while the NVA started an aggressive ground assault. Two friends next to me – dead. One I had just changed places with; a father who had four kids. He told me that night he decided not to stay in the service, as others in his family did. A few years ago, one of his daughters phoned me. She wanted to know something about the Dad she never knew. She always believed he died in a plane crash. I said no, he died on the ground, next to me, a hero, believing he was doing the right thing. That early morning, half of my company was wiped out. That's when every ounce of youth and innocence, I was trying to savor, was finally gone. I even felt somewhat peaceful for a moment, but the horror continued when our choppers were loaded full with men crying, "Oh God, "and for their Mothers. The faces I saw in the MASH unit will always be branded in my mind. I refused to die because I was loved by my wife, family, friends, and God. God played a big part, and there are reasons why He spared me. I see one reason every time I look at my daughter. Also I had to give this speech at my 30th class reunion. Vietnam war. Our war was like no other. Most went over alone…and returned alone. We slipped back into society and tried to forget the war. We also had no one to talk to about it, so we hid our emotions and went on listening to others who knew all about Vietnam, who had never been there. We, as returning veterans, heard all the comments-"How many people did you shoot," "You didn't have to go you know,"- "Ya'll fought for nothing," comments that proved to me those my age were still very naive about what Vietnam was really like. I've encountered many thoughtful people who showed me sincere respect for what me and my comrades sacrificed and endured. And we, by some, were labeled as losers of a very unpopular war. We, in battle, didn't lose the war. It was lost here by the politicians and those who knew they wouldn't have to send their sons into the hell hole we called, "The Nam." Does Vietnam ever cross my mind? Yes, I can honestly say - it does, a lot of times. It's only natural - a young man right out of high school can't be thrown into a horrifying situation such as war, and not be affected. But- it's because of Vietnam, I’m able to stand before you tonight, confident. Most Vietnam Veterans have been able to face all their challenges in life head on. The Vietnam experience taught us well how to survive and taught us we could accomplish anything we really wanted to. Most Vietnam Vets have become successful in business and in life. Contrary to many beliefs, the Vietnam Vet is a caring emotional person, who loves his family, country, and life. A person who enjoys the simple treasures in life most take for granted. Sometimes I think back on who I once was, and I think of those who died and wonder what they could have been. Yes they cross my mind. I get sad, and at times I smile. You see, men in battle get very close to each other. William Shakespeare wrote almost 400 years ago, "We few, we happy few, we band of brothers, for he today who sheds his blood with me, shall be my bother." Words of so long ago still hold true today. When it was brought up at a reunion committee meeting that someone suggested we honor those out of our class who served in the military, I quickly felt a connection and a desire to be the one to say something. I felt it important to myself and my comrades to express real, emotional feelings, about a difficult period in our young lives. I speak these words, not for any recognition to myself, but so all in here, can understand some feelings from those who served. Though some didn't serve in battle, they too were ready, and they gave a big part of themselves in a very unselfish way. Some made the military a career, for this we say, "Thank you for your service." In 1968, we all had opinions on what was right or wrong about the war. That doesn't matter now. We all lived with this fear in our teen years that one would go to Vietnam if one didn't stay in school. We learned early on we were entering a cruel world. Martin Luther King was assassinated, then days before we graduated, it was Bobby Kennedy. In 1968 we were being told we had a handle on the war. That changed with the attacks during Tet. When Viet Cong infiltrated Saigon and launched attacks all through cities and towns, we thought were safe. In 1968 we lost our beloved Frank Russell to cancer. And in 1968, a fun loving kid, quit cruising Steak & Shake with his friend Wally, in Wally’s big brown '55 Caddy-because he met his future wife on a warm summers night down on Clearwater Beach. And it was that year, for many of us, Vietnam hit home... One of Clearwater’s own, Jimmy Lewis, was killed in Vietnam. Jimmy was killed after not even two months in country. I can still remember joking with him in Mr. Sackett’s music class. A few days ago, he would have turned 50. I know he'd be proud I'm talking about him. Guess you could say he's one of our "Forever Young Heroes." I touched his name on The Wall, in DC last November. Panel 37W, line 57. I touched many names that day, all heroes. I want to believe those on the Wall died for a purpose and the lessons learned by Vietnam are the reasons we didn't let them die in vain. The way we go into battle now has changed because of Vietnam. Never again will our young-our children fight with their hands tied, never again will our young fight and die without a clear objective by our government, and never again will we, as a nation and as a people, let a war divide us. Never again will our young go to war without full support. Those are reasons why some of my friends grace that infamous long, black wall, in Washington DC. Classmates, I've just taken you on an emotional roller coaster ride. That is what Vietnam was all about. It tugged at your deepest emotions and hit on all your senses, many times over until you became numb. Sadly for some, that numbness has never left them. Yes we've all faced difficult times, for some, it was Vietnam. Today, I can't say, I regret serving there. The reason, because of the ones I served with. I feel privileged to have served with fine, brave young men, from all parts of the country, who sacrificed it all, for their beliefs and their country. Some died believing we would only win the war. As youths, we had our beliefs, and we all never stopped believing and dreaming. We all can be proud of what this class of '68 has accomplished. Those who went to college should be proud they followed their dreams.. I am proud of what I had endured and accomplished in my life. And, I hold no grudge to ones who didn't serve. That has to be understood, and is important to me. Many over the years have told me they felt guilt. Those who ever experienced battle would never wish war on anyone. So, no one should ever feel guilt for not serving. What would be nice is for all to show respect to those who did, and I feel this class, like always, has decided to be the leader among other classes and honor those who served. We've come a long way in these 30 years. We've dedicated ourselves to raising our families, working hard, and serving our communities. Be proud, we've done what was expected of us, and more. We've made our mark, we are America. To live as Americans, as we do, we have to thank those who gave for our country and those who ever wore a uniform in peace time or not, any branch of the service. The Vietnam Veteran, was probably the last warrior of his kind. Your generation’s warrior, the so called, "Hippy generation warrior." Well, let me say, I saw how that Hippy generation fought and died. You can be proud; they were as brave and courageous as any before them. Freedom is not free, it comes with a price. I appreciate that my class wanted to stand and say thanks to those who served. I hope my words did speak for all here tonight. I would like all Vets, right now, who served this country, to stand. It's been a long time, but now I can finally say, "We were welcomed home." Good bless you all. I’m a Proud Vietnam Veteran, holder of the Purple Heart Medal -- and proud to be your fellow 1968 classmate. Thank you. You may contact Phil at philzano@aol.com. Please note that Jim Drain did not have an email at this time, thus these messages were received by Phil Ferrazano. Several years ago I woke up one Sunday morning with the worst hangover of my life. For some reason I had this burning desire to go to church. At the time it was not something I normally did willingly. One of the kids was sick so my wife could not go with me. I would have to go alone if I was going. For some reason I just had to go. I drove 20 miles to a little church in Palm Harbor. Some speaker name Jim Brown was speaking this day. He had the whole congregation laughing at his comments and jokes, that is all except me. I had tears running down my face. I had no idea what was going on. All of a sudden this speaker stopped and said there is a young man out there that feels.... And he spoke how low and worthless this young man felt. He asked for this young man to come forward. Next thing I knew I found myself standing in front of him sobbing. He told me how I felt was all a lie. He told me how God saw me. Then he told me what God was going to do in my life. He said I would be the first Board member and Deacon of a new church that no one knew anything about. Also what a major financial part I would play in the building of the new sanctuary and many other things that were going to happen in my life. Within a couple years we did decide to build a new church. I was the first Board member and Deacon. I put my financial statement on the line to buy the property to build the new church and on and on everything he said came to pass. There has never been a day that my faith in Jesus Christ leading my life has wavered since then. He had spoken to me through this man and His words have come to pass in my life. I never would of believed that Sunday morning when I woke up feeling like the lowest form of life on the face of the earth, that I would come home feeling powerful, inspired... a new and different person with a purpose in life. Why do I tell you this story? When you stood on that stage I never would of believed Phil Ferrazano Jr. was capable of delivering the most inspirational heartwarming words I have ever heard since that Sunday Morning. You gave each and every one of us new meaning to life just when we were all feeling old and falling apart. I heard someone say you had been writing it for thirty years. I believe you had a little help delivering it. It was more perfect than humanly possible. 210 people left that night telling the Phil Ferrazano Story far and wide. When everything else about the reunion is forgotten, your words will be buried deep within all of our hearts and those words will be remembered eternally. You gave real meaning to our reunion, not just another chance to get together, party and talk about old times. Thank you for what you endured 30 years ago for us... Thank you for telling us the truth... But mostly, Thank you for setting us all free. Well done and God bless. Thank you so much for your speech, Phil. You talked from your heart and it touched our hearts deeply. For many of us who did not go to Vietnam, your words brought that experience a little closer to true understanding. Your delivery was incredible and you more than deserved the standing ovation you were given! Thank you very much. How wonderful to see you again and share our past experiences, lifestyles and families. Kathy is so charming, I was honored and delighted to meet and dance with her. Your speech was exceptional and professional. It touched upon so many emotions, as you said, "a rollercoaster", that I could feel myself rising and falling with your inflection, images and delivery. I could not help visualizing JF Kennedy as you spoke, ironicly, as the man who really put the US into the War but who now I heard acknowledge the error. Thanks a lot for the chance to participate (as far as I did) in the Vet program. It woke me up again. And that was a great speach, too bad I didn't hear it 10 years ago. You hit the nail right on the head, and were able to bring a couple of good ideas together in the same breath. It also sounds like the speach, and preparation for it, was a real release for you. One of the best speeches I've heard. You also have that type of delivery that has won elections. Good going. I admit I've put a lot of distance between myself and things from years ago, but sometimes I need to be woken up again. Thanks. I will stay in touch. Maybe you'd like to see a video of that play from which you quoted, "We few, we happy few ..." You've probably already seen it, but if not I'd like to drop it off. It's an asskicker about war and leadership in the Middle Ages. I cannot tell you how moving the Vietnam Tribute was. I am so happy I stayed for Saturday night. I sat at the table and cried like a baby. I looked at Bruce and Mickey and they were crying.. the whole table. It was an inspiration and a testimoney to both your comrades and our classmates. Thursday Night at the Palm. who purchased up for ads for our booklet. Again, this helped us keep costs down and provided a wonderful sovienier of the event. Poem "Those Forever Young Heroes"
This site is sponsored by the Clearwater High School Class of 1968 Reunion Committee. If you have any comments or suggestions, please send e-mail to Patty Day Perkey at clearwaterhigh68@gmail.com. Copyright © , Clearwater High School Class of 1968 Reunion Committee. All rights reserved.